Today we celebrate America's forgotten history, emphasizing the moral, religious and constitutional foundation on which America was built. We've all learned lessons and pieces in school, but so much of the story is often left out. Enjoy patriotic songs with Bill Lambert and a performance by Kid's Church. This year marks 230 years since our founding fathers gave us our national birth certificate. To this day we remain as the longest on-going Constitutional Republic in the history of the world. Blessings like this are not by chance, or by men. They are blessings of God. We think of July 4th, 1776 as a day that represents the Declaration of Independence and the birth of the United States of America as an independent nation. On the 4th of July, 1776 the Continental Congress _________________________ the final _______________________ of the Declaration of Independence. Liberty depends first upon our understanding the foundations on which this great country was built and then preserving the principals on which it was founded. Let’s not let the purpose for which we were established be forgotten. The Founding Fathers have passed us a torch, let’s not let it go out. Judeo-Christian Ethics = The influence of the Hebrew Bible and the New Testament on one's system of values, laws and ethical code. It is not just a system of theological thought, but a culture of values as seen in an individual's right to life, liberty and the pursuit of happiness. Date Change for this month! Monday July 3rd. Treasure Hunting is a great way to hear clues from God and bring supernatural encounters to people around you. Learn more at the monthly meetings at Love Joy Church, 6 to 9 pm. Slogans. Symbols. Sayings. How do you express yourself? As Christians, we know the Bible is a book of God’s limitless love, His promises, and His desires for our lives. And it’s in these words that we learn how to live and what to live for. Join us on Wednesday July 5 at 7 pm and hear from 6 different Love Joy Members as they share a verse that has changed their lives. Childcare available. Men, join together for your monthly breakfast. Enjoy fellowship and an encouraging word on Saturday July 15th from 9 am to 11 am. Sign up in the lobby today. The front yard of our church comes alive with a FREE carnival for our neighbors on Wednesday July 26th. Help us bless our community by volunteering to oversee games, paint faces, cook hot dogs, make sno-cones or cotton candy and so much more. 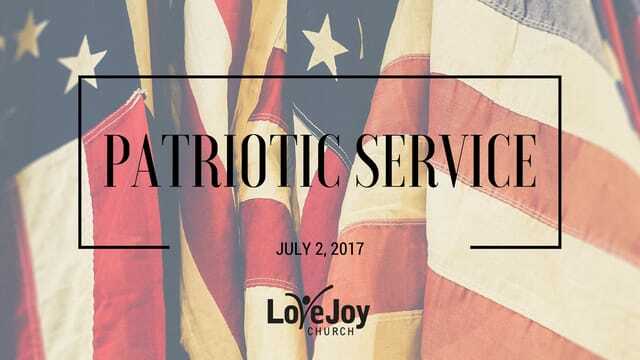 Sign up at the Welcome Center or contact Pastor Judy jburgio@lovejoy.org. Donations for hot dogs are greatly appreciated. Love Joy kids are invited to this Vacation Bible School in Alden. The theme is "ROME: Paul and the Underground Church". Kids participate in a memorable Bible-times marketplace, sing catchy songs, play teamwork-building games, dig into Roman eats, visit Paul while he’s under house arrest. Ages 3-11 at Grace In Community Church, ​11269 Broadway St. Alden, NY 14004. Register online at www.graceincommunitychurch.com Always absolutely FREE!